The date is set for 2018 Bark Park Holiday photos! Plan to attend this fun event on Saturday, November 17th at H&S Feed & Country store between 9 am and 2 pm. 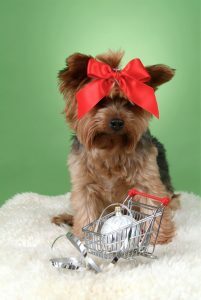 Bring your pup by for a holiday photo, the perfect holiday gift for pet lovers. Each dog that comes in for a photo will receive a free gift from us! There is a $10 sitting fee that includes a digital copy of the photo. Printed 5×7 photos are an additional $5. Proceeds from the 2018 Bark Park Holiday Photos benefit the Oskaloosa Bark Park. This year’s project focuses on erosion projects. ⛄☃❄ Please come out and see us. This entry was posted on Tuesday, October 23rd, 2018 at 11:20 am	and is filed under News & Updates. You can follow any responses to this entry through the RSS 2.0 feed. Both comments and pings are currently closed.